Since my first game at Nerdly, I knew I was going to love the hell out of this game…and I do. Here’s a collection of my AP reports as well as playsets and scores I’ve cobbled together. Enjoy! 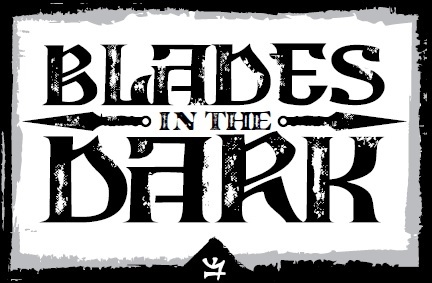 Vigilantes is a Blades playset about playing the good guys, or as close to the good guys as you can find in Doksvol. The playset includes one new gang type, Vigilantes, as well as new rules for turf, claims, entanglements, downtime, and payoffs as they apply to Vigilantes. Outside of the Imperial City, the greatest universities in the empire are found in Doskvol. From the high walled towers of Whitecrown to the merchant class guilds of Charterhall, if there is a mystery to be solved, a philosophy to be extolled, or a schematic to be designed, some student of Doskvol is toiling late in the night to gain course credit for it. This was an April Fools joke that ended up having some legs. Here’s a playbook for a young criminal, based entirely off the movie Young Offenders and our quirky love of Cork, Ireland. This playbook was co-designed with Karen Twelves. It’s is not playtested, it is probably not good, but it is fun to read. I’m a fan of quick to assemble scores that are based on the players input at the table. If you want to run something for a convention game or to kick off a campaign, give these a look. Gaddoc Rail: The northbound Argonaut from Wintercliff clattered into Gaddoc Rail Station, its cattle catcher ablaze with electroplasmic lightning. On it was your mark. Nobody left the station after it pulled in…No one has left the station since. Charterhall University: The Noble Order of Crows is an institution which claims it’s origins date back to the Emperor’s gift of Deathseaker Crows to Bellweather Crematorium in year 492. They are a benefit society pledged to elevate the status of their members and of the Doskvol Devil Hunters…Yesterday charges were brought against your chapter. You’ll be expelled if you are lucky, joining the Deathlands Scavengers if you’re not. Scurlock Manor: On behalf of a patron who offered enough to make it worth your while, you bypassed Scurlock’s external defences, made your way into the manor, and got your hands on the score. That’s when all hell broke loose. Doskvol Riots of 847: You were woken by shouting in the street, torches lit, and the crack of a gun shot. Whatever was stirring under the surface has erupted…and you’re crew is right in the middle of it.